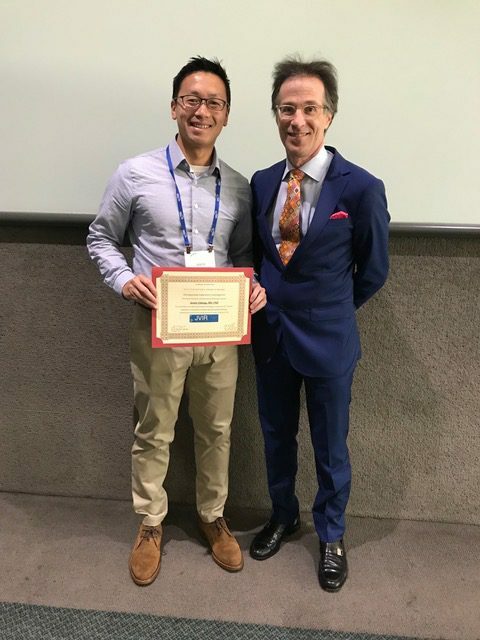 Jason Chiang‘s manuscript “Potential mechanisms of vascular thrombosis after microwave ablation in an in vivo liver” was selected for a JVIR “Distinguished Laboratory Investigation” award. You can read more about the paper here. See the full manuscript here. Jason (pictured above with journal editor, Ziv Haskal) received the award March 20 at the 2018 Society of Interventional Radiology annual meeting in Los Angeles, CA. Congratulations to Jason, his co-authors, and the Tumor Ablation Lab for this honor!